(Time in Newcastle and Morpeth in bold, at sea or seeking a ship in London in ordinary). 1748 – Cuthbert Collingwood born on 26th September in a house on the Side, Newcastle. 1759 – Attends Royal Grammar School. 1761 – Goes to sea, along with his brother Wilfred, as a ‘follower’ to his uncle Captain Richard Brathwaite. They join the 28 gun frigate Shannon. 1762 – Follows Brathwaite to the 24 gun frigate Gibraltar. Serves in Home and Atlantic waters and makes his first voyage to the Mediterranean. 1767 – Transfers to 28 gun frigate Liverpool, still following Brathwaite. 1770-71 – Rated master’s mate by this date. Starts log of cruise in the Mediterranean on 8th December 1770 as Liverpool sails towards Menorca. Cruises in Mediterranean through 1771. 1772 – Transfers to Portsmouth guardship Lennox, under Captain Robert Roddam, a fellow Northumbrian and family friend. 1773 – Transfers to 50 gun ship Portland and sails to the West Indies. Meets 15 year old Horatio Nelson for the first time. Transfers to 80 gun ship Princess Amelia and sails up the East Coast of America before returning to England. 1774 – Arrives in Boston, Massachusetts in July 1774 as master’s mate aboard 50 gun ship Preston. 1775 – 17th June 1775 – Commands second wave of boats for the amphibious attack on Bunker’s Hill and distinguishes himself by his coolness and bravery. Promoted Acting-Lieutenant. 1776 – Returns to England aboard 64 gun ship Somerset. Promotion confirmed, but he stays in London to seek another appointment to a ship. Appointed to 14 gun sloop Hornet and sails for West Indies. 1778 – Replaces Nelson in the 32 gun frigate Lowestoffe, then in the 50 gun flagship Bristol. 1779 – Twenty year old Nelson promoted post-captain to the 28 gun frigate Hinchinbroke. Collingwood replaces him as master and commander of the 14 gun brig Badger. 1780 – Nelson sent home to recover from illness. Collingwood promoted post-captain in Hinchinbroke to replace him. 1782 – Returns to England but probably stays in London seeking another ship. 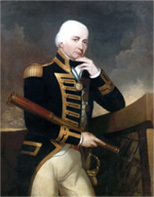 1783 – Sails to West Indies as captain of 44 gun frigate Mediator. 1786 – Returns to England and leaves Mediator. Remains in London but fails to get another ship. 1786 – Travels north to Newcastle towards the end of the year. 1787 – 21st April, Collingwood’s brother Wilfred dies at sea in the West Indies. 1790 – In May Collingwood is in London seeking another ship. First mention of a dog, that may be Bounce. In June he is appointed to the 32 gun frigate Mermaid. In October Mermaid is at Portsmouth waiting to sail to the West Indies but now Collingwood doesn’t want to go because he has reached an understanding with Sarah Blackett and is anxious to be married! Sails for the West Indies soon after. 1791 – Returns to Portsmouth in April, but has to remain in Portsmouth until the ship is repaired and the crew paid off. 1791 – 18th June 1791, marries Sarah Blackett at St. Nicholas’ Cathedral, Newcastle. 1792 – Cuthbert and Sarah rent a house in Morpeth. 1792 – May, birth of daughter Sarah. 1793 – February, returns to London to seek a ship. 1793 – Appointed as flag captain to Rear-Admiral George Bowyer on board 98 gun ship Prince. 1793 – August, birth of second child, Mary Patience. 1794 – Transfers to the 98 gun ship Barfleur and takes part in the Battle of the Glorious First of June. 1794 – Short trips to Morpeth in July and October to visit his family. 1795 – Takes command of 74 gun ship Excellent. Sails to the Mediterranean. 1797 – Feb 14th takes major part in the victory at the Battle of Cape St. Vincent, coming to Nelson’s aid at a critical point of the battle. Receives a gold medal for his efforts and a belated one for the Glorious First of June. 1799 – February. Returns to Morpeth and is promoted to rear-admiral of the white. 1799 – June. Blockading the French with the Channel fleet in the 74 gun ship Triumph. 1800 – Transfers to 98 gun ship Barfleur. Blockade continues with home base being Plymouth. 1801 – January. Promoted Rear Admiral of the Red. Sarah and little Sarah visit Collingwood in Plymouth at the end of the month but Collingwood is able to spend less than a day with them before he is back at sea. They remained in Plymouth through the spring and summer and he was able to spend a few more days with them when he returned to port at the end of March and after other cruises. 1801 – Purchase of house in Morpeth, which the Collingwoods had previously rented. 1802 – March. Peace of Amiens. 1802 – May. Collingwood returns to Morpeth and begins to make improvements to the house. He enjoys growing vegetables and taking walks in the Northumberland countryside. Accompanied by Bounce he plants acorns as he goes. 1803 – May. War declared with France and Collingwood returns to the blockade of the French. 1804 – April – Promoted to Vice Admiral of the Blue. 1805 – Blockade of Cadiz. 1805 – 21st October. Battle of Trafalgar. Collingwood leads the lee column into action in the 100 gun ship Royal Sovereign. Death of Nelson. Collingwood takes command and completes the victory. 1806 – Now Baron Collingwood of Caldburne and Hethpool, Vice – Admiral of the Red and Commander in Chief of the Mediterranean. Continues to blockade Cadiz. 1806-10 – Military and diplomatic activity throughout the Mediterranean. 1809 – Transfers to his last ship the 110 gun Ville de Paris. 1809 – Death of Bounce, who fell overboard during the night. 1810 – 3rd March hands over his command due to ill health. 6th March sets sail for England in Ville de Paris. 7th March Death of Admiral Lord Collingwood. 1810 – 11th May. Buried in St. Paul’s Cathedral.